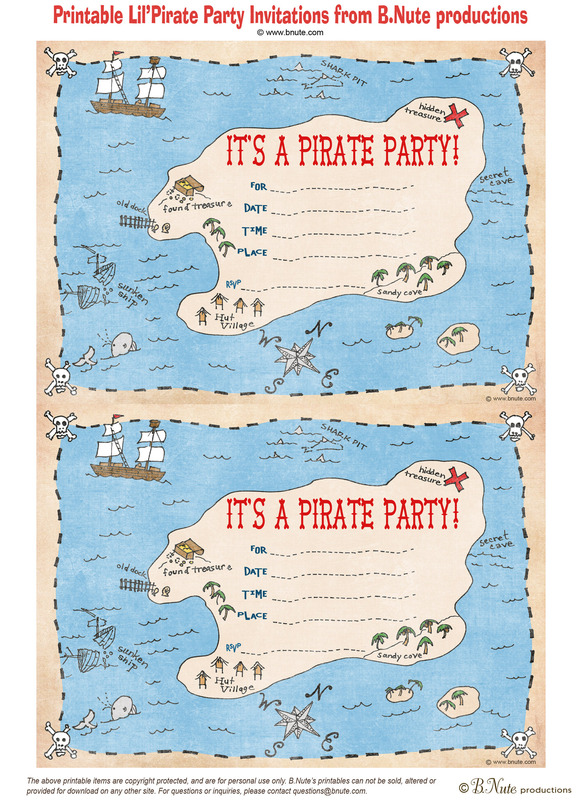 Time to get those lil'pirates outside and running around on a treasure hunt at your Pirate Party! Here is a free printable Pirate Party invitation perfect for this occasion. All guests will find their way to your party and be excited for the fun. 1. Select link above, and print out from your browser. Use card stock to give invitations some weight. 2. Trim the invitations out of the paper. 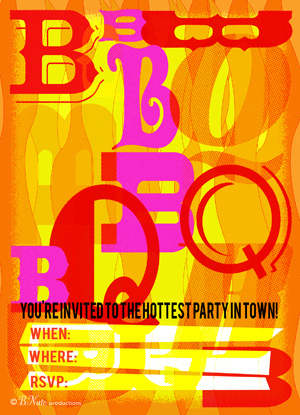 Each invitation is 5"x7". 3. Fill out your party details. 4. Place in A7 sized envelope or bigger. 5. Prepare for your Pirate Party! Printable items are copyright protected, and provided free of charge by B.Nute productions for personal use only. B.Nute's printables can not be sold, altered, or provided for download on any other site. For questions or inquiries, please contact B.Nute productions. I found you searching for Pirate Party Invitations - just wanted to see what else was out there. Almost disappointed to find something I liked so much! 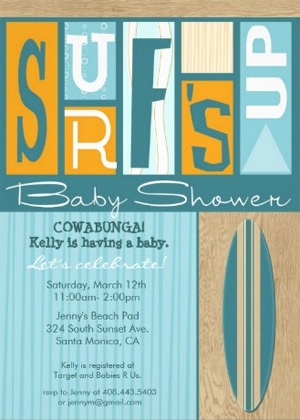 We have some free printable invitations at SpottyPencil.com. Apart from your site I haven't seen anything else I'd be happy to use myself! I LOVE these!! But I'm having a problem printing it. They are printing too big (the right side is off the page). I'm printing on normal 8 1/2 x 11 paper. 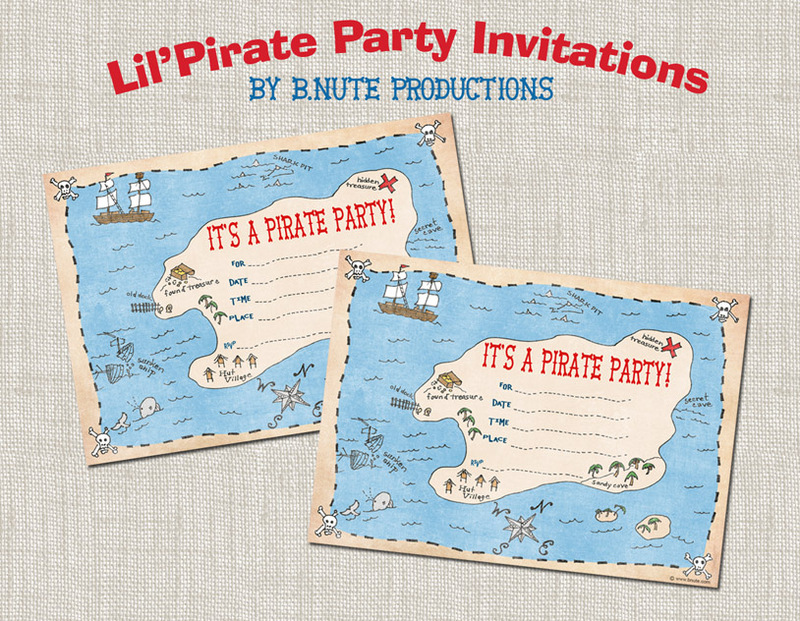 Hi Betsy, just wanted to say thanks for the your pirate party invites! They are gorgeous! We are rolling them up into a bottle with sand and shells. Thanks! 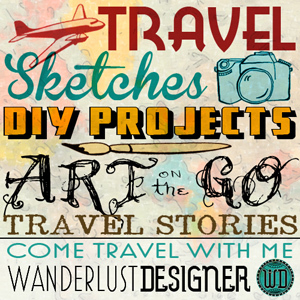 Thank you for sharing this free printable! I typically design my own invites but don't have the time to spare and my son LOVES this! I'm having problems trying to get them to print 2 5x7s per page. I select the link and print (preview looks correct) but is printing more like a 3x5. Any suggestions? Surf's up! It's time to party. Time for a sizzling BBQ! All images in this blog are copyright of bnute productions unless otherwise noted. Copyright 2013 B.Nute productions. Powered by Blogger.